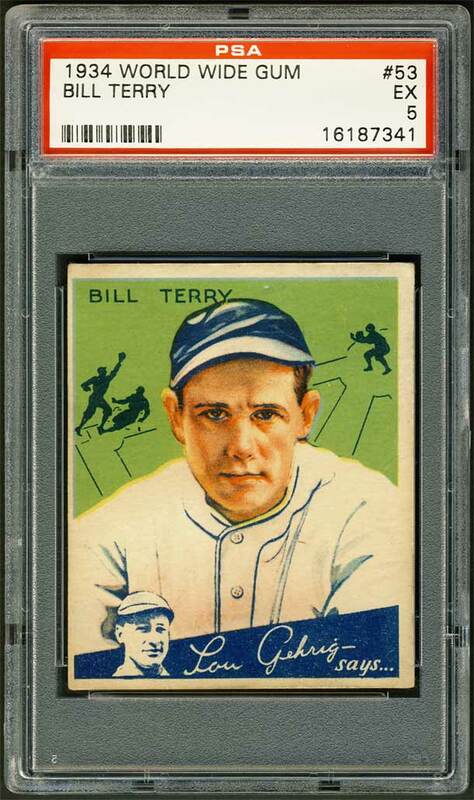 A career .341 hitter, Bill Terry was the last National Leaguer to hit over .400, batting .410 in 1930 with an amazing 254 hits. "Memphis Bill" had more than 100 RBI from 1927 to 1932. Showing long-ball power when he wanted, Terry smashed 28 homers in 1932. Generally, though, his strengths were doubles and triples. 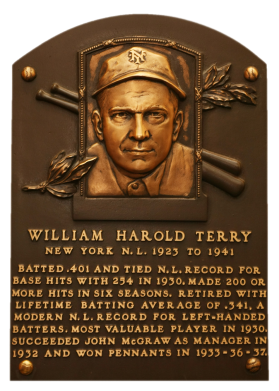 A fine defensive first baseman, he took over as Giant manager in 1932 and led the team to three pennants. Comments: In May, 2002 I purchased a PSA 2 1933 Goudey card on eBay. I then upgraded to a PSA 8 but sold the card via my website in July, 2003. Later that month, I picked up a PSA 4 off the Larry's Vintage Baseball Cards website. In August, 2003 I upgraded to a PSA 6 with an eBay win; and then a PSA 7 in December, 2003 via another eBay auction. 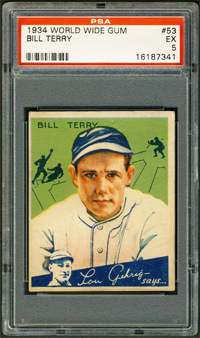 I also owned a '33 Goudey Mel Ott #127 and decided to swap the Terry out for another type card in March, 2010. I won an eBay auction for this 1933 WWG PSA 5 from Memory Lane, Inc. 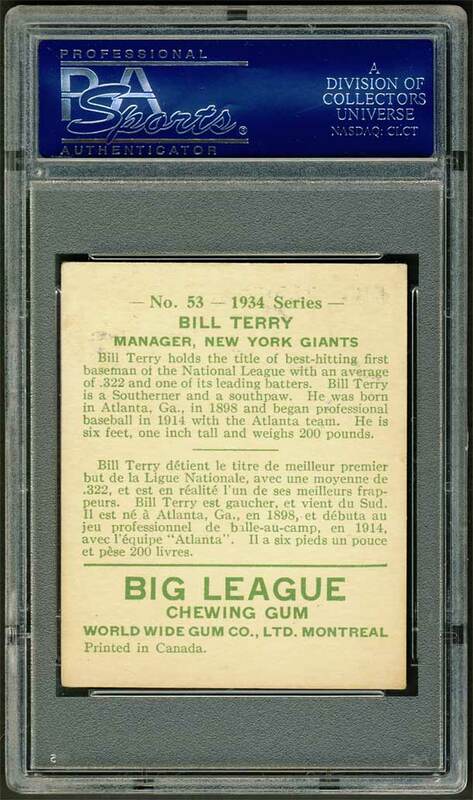 Description: Again a near-clone of the American issue, the '34 "Canadian Goudeys" feature the same number (96) and size (2-3/8" X 2-7/8") of cards. Player selection is considerably different, however. Cards #1-48 feature the same front design as the '33 World Wide/Goudey sets. Cards #49-96 have the "Lou Gehrig says..." graphic on the front. 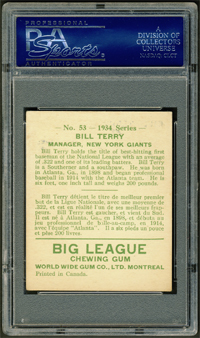 Unlike the 1933 cards, backs are only found with the bi-lingual text.